People in finance tend to be obsessed with thinking of “everything” in yearly terms (a direct effect of short-term focus on individual bonuses). Sure, portfolios and positions need to be valued, but the economy does not change because it is a new year. The same applies to markets and assets. Nothing is “fixed” just because a new year has begun. The year has so far started with more of the same: high volatility, poor stats out of China, equities down, credit up etc. The turmoil has since then continued, and gold has subsequently climbed higher. The channel we outlined in early autumn last year continues to hold. 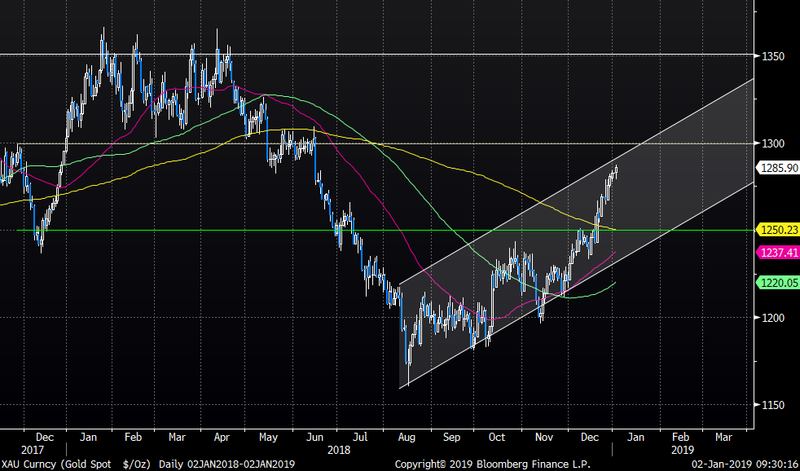 1300 is the first real resistance to consider. Note how the 50 and 100 day now both trade positively sloping. Lower implied volatilities offer cheap ways to play directional bets. We have seen implied vol in GLD US (Gold ETF) fall over past sessions. This offers cheap ways to gain exposure for directional moves in gold such as call spreads for example. 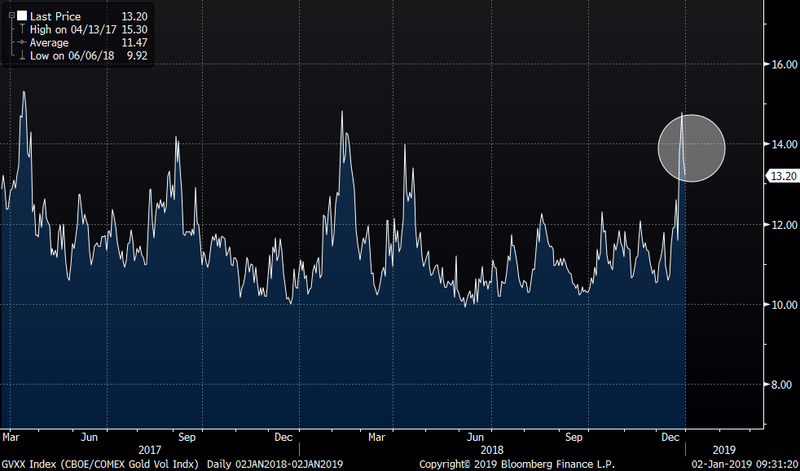 Recently gold volatility, GVXX index, has spiked higher and the relative values of such options strategies are less interesting, but the direction and pace of the move in gold, as well as the move in gold volatility have played out well. Our short-term focus is watching the 1300 resistance carefully here.